What makes Spencer trumpets so special? Every Spencer trumpet is individually hand-crafted to excel in every musical genre. This is achieved by the skilful marriage between the latest high-tech machining and hand- crafted artisan components. Spencer trumpets use the same high quality stainless steel valve groups as those found on some of the world’s most expensive and boutique instruments. The bells are of one piece construction, and use a similar flare to the Mt Vernon Vincent Bach instruments. All these components are constructed using some of the industry’s most advanced manufacturing techniques, so conformity and reliability are second to none. M/K Drawing (www.mkdrawing.com), based in Wisconsin, manufacture custom leadpipes and tuning slides, and their products are well established retro-fittings for professional- quality trumpets.Both the Bb and C trumpets use variants of their vintage Mt Vernon 7 leadpipe, hand-drawn in either bronze or sterling silver. Most manufacturers use leadpipes that are made of brass, but even the most expensive instruments have leadpipes that can de-zincify or “red rot” over time - this can be under a year! Unless specified by the customer, Spencer trumpets use Bronze or Sterling silver leadpipes whose structural integrity does not deteriorate. These are fitted to the instrument using “S” braces, whose precise positioning encourages even response and focus throughout the range. To achieve this, every instrument is play-tested and adjusted during assembly. For a truly bespoke instrument, customers are invited to try all the available options while their instrument is being built. This unique experience gives the customer the chance to not only understand how the instrument is crafted, but to make sure it perfectly tailored for his or her playing styles. After assembly, Spencer trumpets are designed to be plated with 12 microns of pure silver. However, other finishes are available on request. 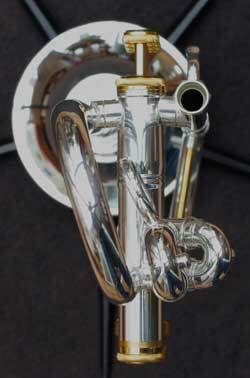 Both Bb and C trumpets are available in two weights with the thick walled slide tubing of the heavier instruments aiding focus and projection. 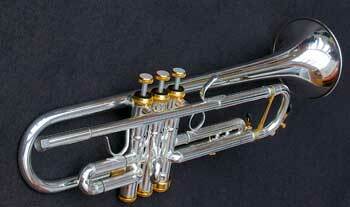 The range of Bb trumpet configurations are designed to excel in all musical arenas. whether you are a looking for an instrument that will sing over a symphony orchestra, or fit in an intimate jazz setting. Whatever instrument you choose, it will be free-blowing, extremely even across the range and have excellent intonation. Tone collar Supplied, but can be removed for more diffuse tone. 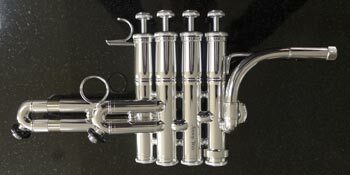 The unique tuning slides and leadpipes used on the Spencer C trumpets are used as retro-fits by tens of professional players worldwide, and these form the backbone of the current models. 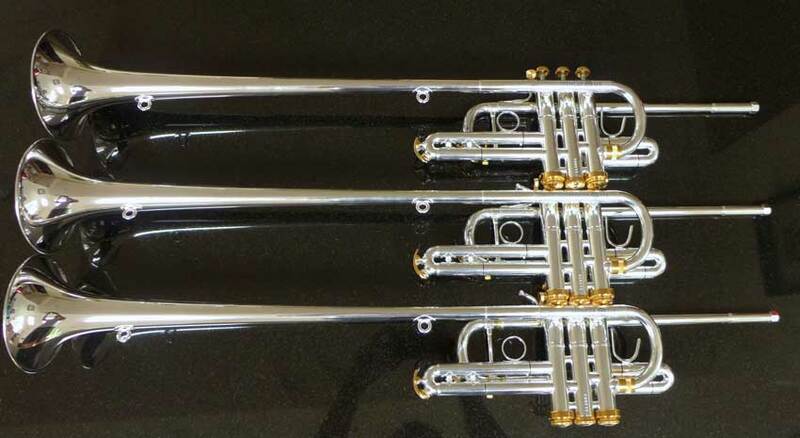 While the C trumpets use very similar components to the Spencer Bb trumpet, they sound and feel very different. In their regular weight, they produce a light, warm focused sound, ideal for solo recitals and most orchestral work. The heavy version is even more focused, and designed to excel in the large symphonic repertoire. The stunning appearance of this instrument makes this an ideal trumpet for weddings and solo performances. However, it is designed to be extremely versatile; being equally at home in a solo/baroque environment or a large symphony orchestra. This is made possible by the two supplied bell profiles which can be chosen, depending on required performance parameters. The Spencer piccolo trumpet has a standard trumpet mouthpiece receiver with a bronze tapered leadpipe. There are no variations for this design. These two models are based on the popular Spencer modular system as used by the bands in the British Royal Air Force. The original design, was built around German Monel Valves and a Bach 37 style bell is still available on request. The M2B & M2C use the same components as the standard Spencer Bb and C trumpets, with the advantage of being able to change bells and leadpipes. The most popular configuration, is on the Bb instrument, where a heavy bronze leadpipe is used for classical repertoire and a compressed sterling silver one is used for big-band/lead work. The Spencer Herald Trumpet has been carefully designed to feel comfortable to hold and play, while still offering the brazen tone qualities associated with these instruments. Originally designed for the Chinese Army Band in Beijing, this trumpet has been thoroughly tested by the finest British Army players who play these instruments daily. Herald trumpets are famously difficult to play, and exponents often need to play difficult and exposed fanfares with no warm-up and in cold dark cathedrals. The last thing a player wants is an instrument that feels alien.